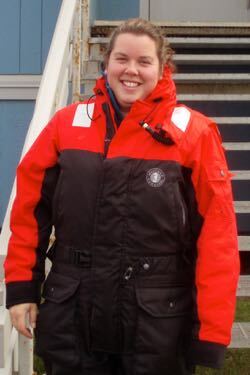 The goal of their voyage into the Chukchi and Beaufort Seas is to follow-up on a tantalizing discovery they made during a 2011 research trip to the same area, when they found — at least for their coastal study sites — measurable rates of nitrogen “fixation,” a process that plays a key role in marine food webs and climate change but was previously thought restricted to much warmer waters. Nitrogen fixation is the process by which certain bacteria and related microbes transform gaseous nitrogen into a form that plants can use for growth. These plants — typically microscopic phytoplankton — in turn support zooplankton, fish, and other larger organisms up the ocean food chain. Better understanding the magnitude and geographic extent of nitrogen fixation in Arctic waters is particularly important given the recent decrease in the region’s sea ice, which is now only half as extensive in summer as compared to 1980, when satellite records began. Less sea ice means more sunlight for marine photosynthesis and the possibility of a more robust food web that could boost fish stocks and ultimately help pump carbon dioxide from the atmosphere to the deep sea, where it contributes nothing to current global warming. 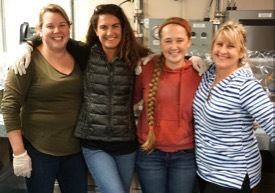 The VIMS team — Sipler, Bronk and graduate students Jenna Spackeen and Brianna Stanley — will conduct their study by collecting water samples at coastal and offshore sites throughout the Chukchi and Beaufort seas. Their ship, the 261-foot RV Sikuliaq , is one of the most advanced university research vessels in the world, with the ability to break ice up to 2.5-feet thick. They won’t, however, need that capability on the current voyage, as they purposefully chose September as the month when sea ice reaches its annual minimum, and populations of nitrogen-fixing marine bacteria their annual peak. Also aboard are scientists from the University of California Santa Cruz and Oregon State University. The UCSC researchers are working closely with the VIMS team to study nitrogen fixation, while the OSU team is focusing on studies of “primary productivity” — the amount of organic material generated by marine plants through photosynthesis. The research cruise is funded by the National Science Foundation. A conservative estimate — extrapolated from the results of their limited 2011 study — suggests what they might find: that nitrogen fixation in the Arctic’s coastal waters could alone account for almost 3 percent of the global total of marine nitrogen fixation, and more than 7 percent of that total if it occurs across all the Arctic Ocean’s ice-free waters. These are significant values for an area where this fundamental biochemical process was recently thought to have no effect. Sipler adds that from a climate-change perspective, “the most pressing question is whether nitrogen fixation has always occurred in the Arctic or is an emerging phenomenon.” A 1961 study in the same area of coastal Alaska found no evidence of nitrogen fixation in marine waters, and scientists have in other areas correlated increasing rates of nitrogen fixation with increasing temperature. If nitrogen fixation in the Arctic Ocean is indeed increasing as these lines of evidence suggest, its effects could spill out into other ocean basins — notably the North Atlantic, long a major harvesting ground for commercial fisheries. Phosphorus, like nitrogen, is a key nutrient in marine food webs. As nitrogen fixation makes more nitrogen available to fertilize marine plants, their need for phosphorous grows apace — like the need for more jelly upon discovery of a new jar of peanut butter. The concern with a reduced flow of phosphorous into the North Atlantic is that a shortage of this nutrient — rather than nitrogen — could become the factor that limits the productivity needed to support its fisheries.